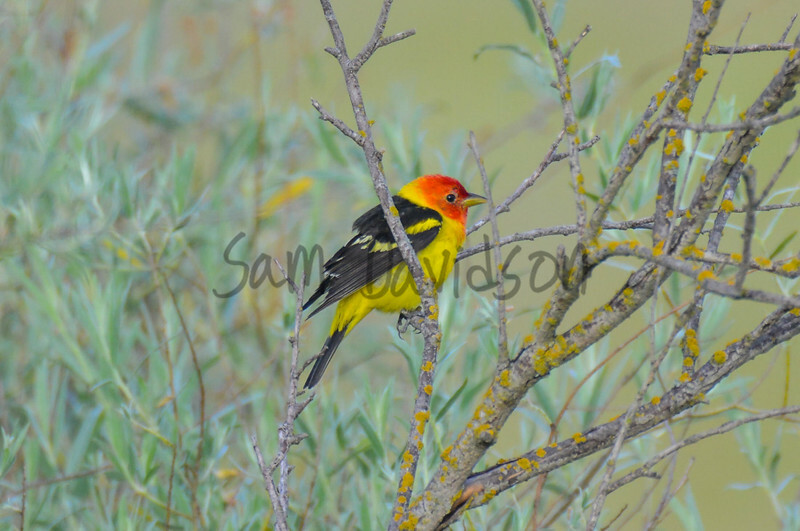 One of my favorite spectacles in nature to witness, wonderfully enchanting behavior. 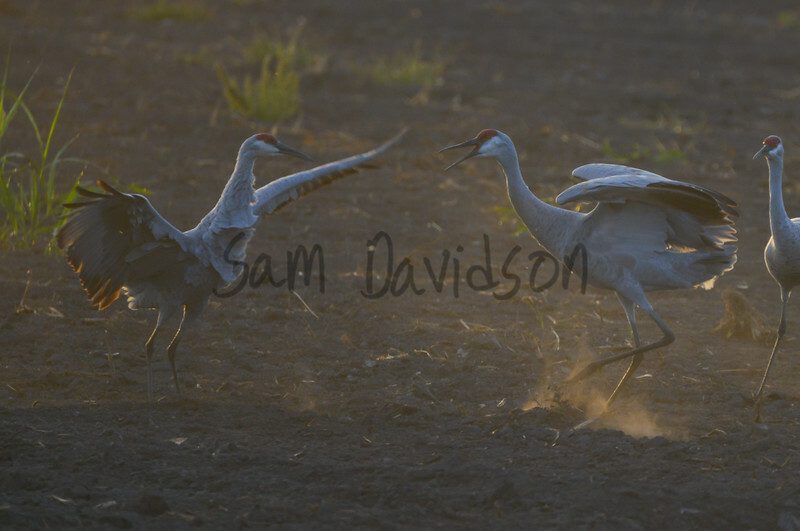 Just two Sandhill Cranes putting on a show for one another, and myself, incidentally. 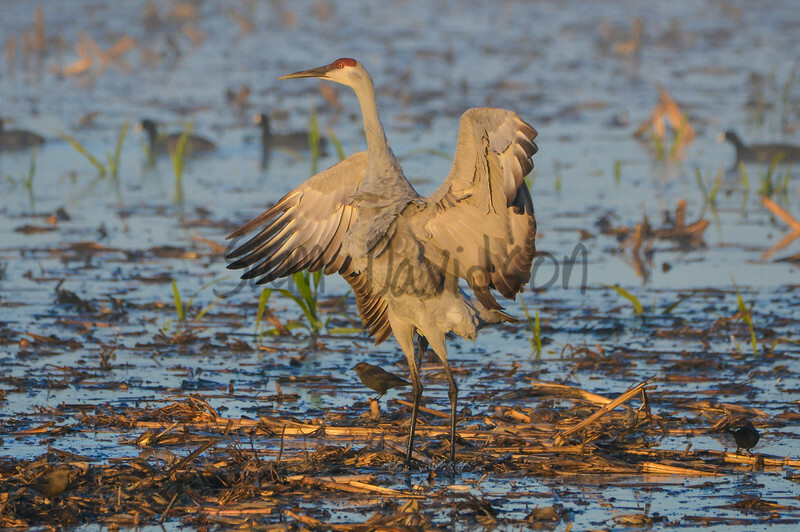 This is truly one of my favorite dancing crane photos. I try to avoid taking photos where I'm looking into the sun but here it worked out wonderfully. 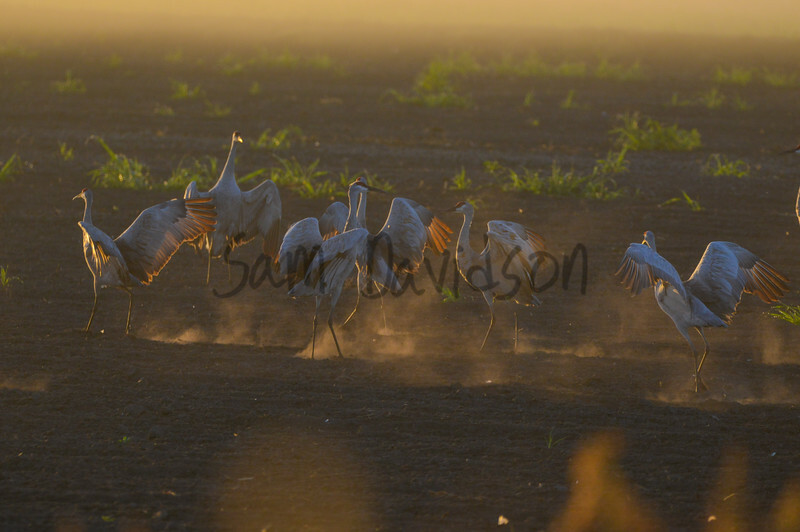 The sun is still low enough in the sky that it has only illuminated a small portion of the dark soil, but the dust that is thrown into the air by the feet of the cranes as they prance hither and thither is subsequently thrown into sharp golden contrast to the shadowy dirt. 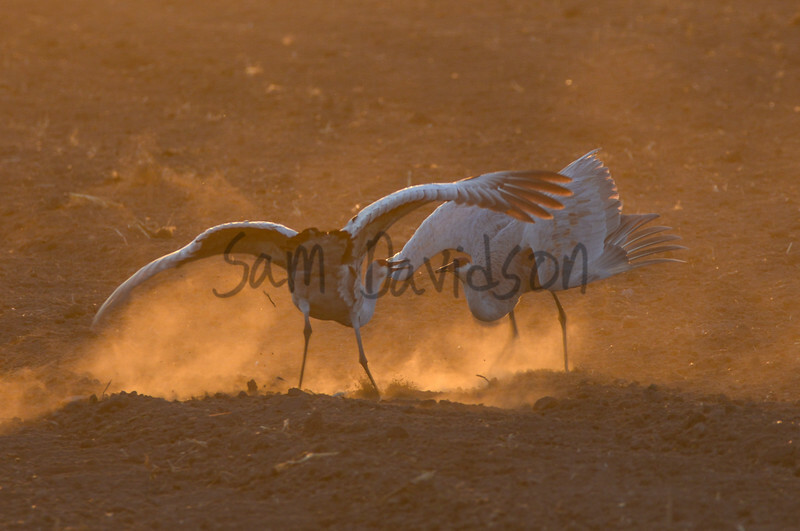 The motion of the birds is still, but because of the dust you can get a good impression of the motion that is indeed taking place. This is an interesting one because, to me at least, that little bit of dust below it makes it looks like this individual crane just took off from Cape Canaveral. 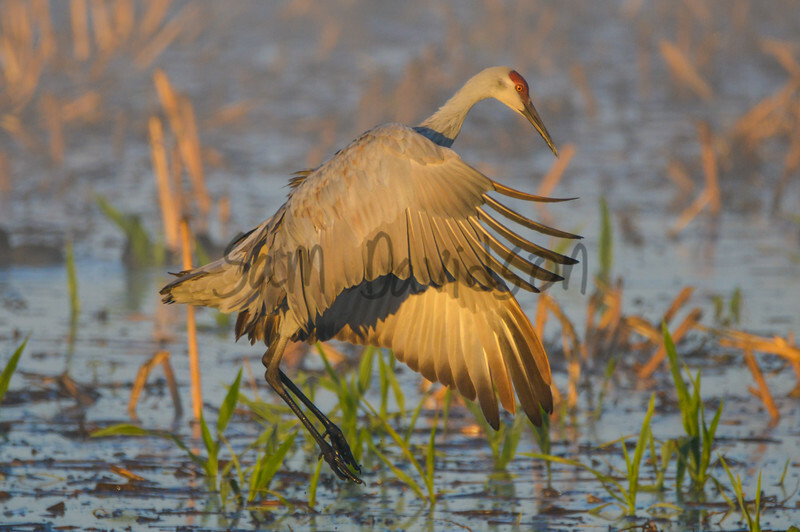 I love this one, just the right amount of golden sunlight on this leaping crane. 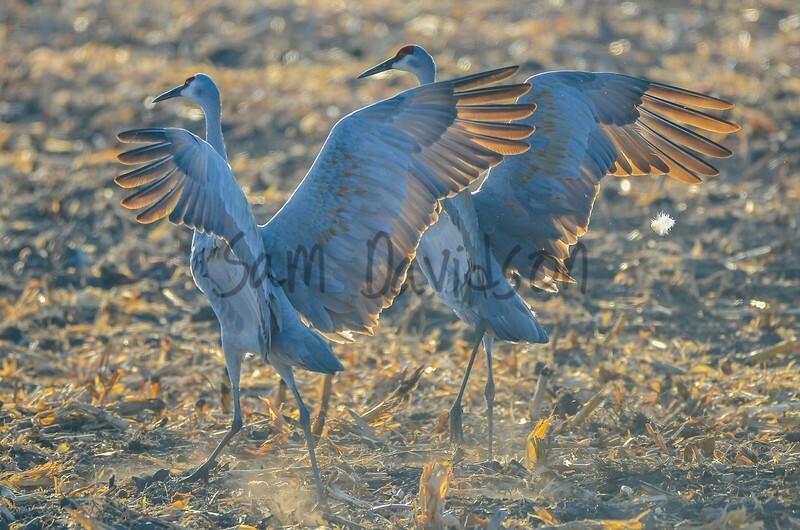 Looks like these two cranes are square dancing! This photo has a strong aura or motion thanks to the flurry of dust, always fun for me to go back and view again. Behavior to which I've just become privy, it's part of their mating dance. 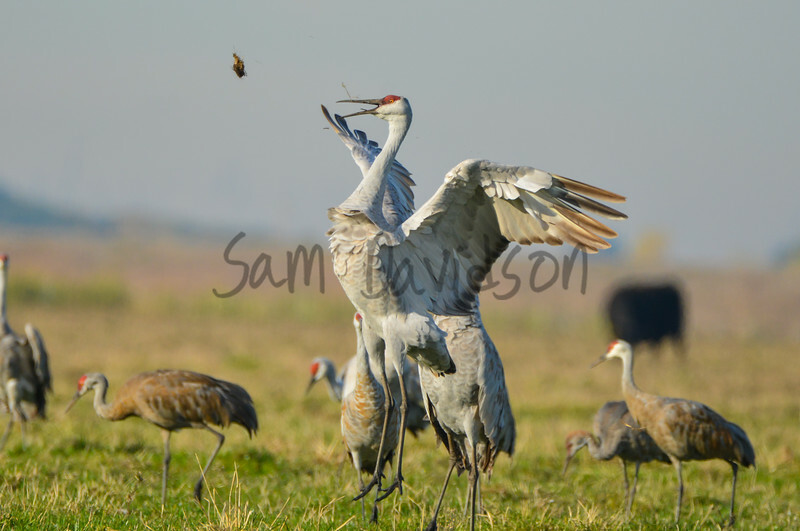 Individual cranes will take something like a stick, a cob of corn, or in this case a glob of dirt and toss it high into the air. It's awesome and enchanting to witness because it's such a unique display. I'd gotten some video of it happening prior to taking these photos, and I find myself very fortunate to have captured them. 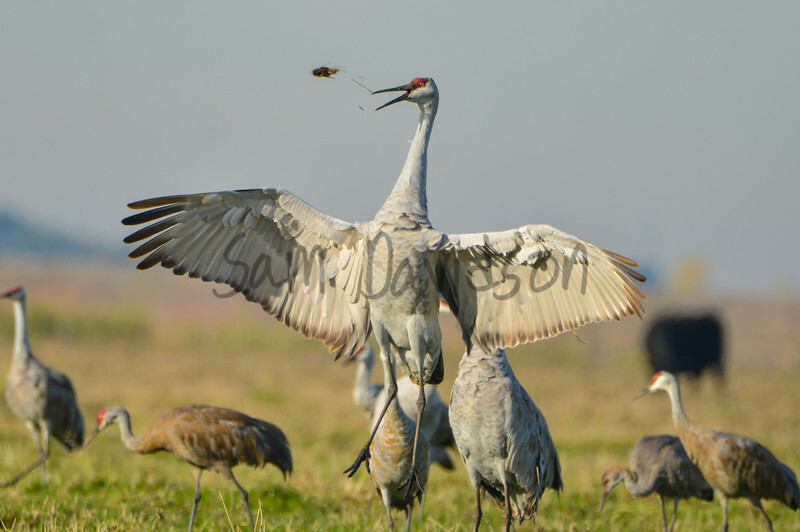 This is the second frame of this crane in mid air having tossed the bit of dirt it had in its beak. The reason why these two images are special to me is because of what I went through to get in the position to take them. 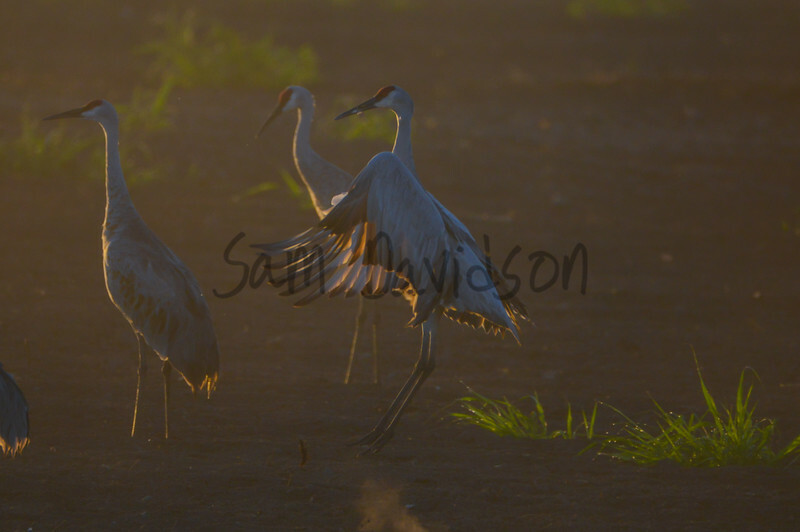 I parked along the side of the road when I saw this group of cranes rather close to the barbed wire fence bordering the street. Between myself and the fence was a drainage ditch. I attempted to cross it and ended up sinking my foot into some soft, wet mud... almost past my shin. I almost lost my shoe but was able to scramble my way up the bank of the ditch and sit on the ground right behind the fence. I knew that whatever I ended up catching from that point on was going to be magical.